I’d never paid such a large deposit for an apartment before, but this was the requirement for the “luxury apartment” I rented upon moving to Houston. 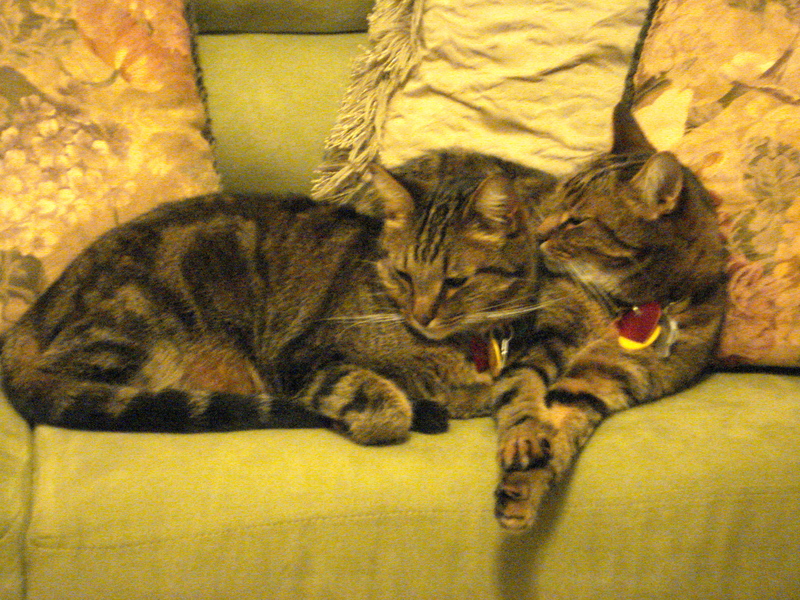 It was because I was the owner of two golden-brown tabby cats. The “pet deposit” was $250 per cat, plus there was a non-refundable “pet fee” of $250, simply for owning one. This was in addition to the usual security deposit of $250. On top of this, you paid a monthly “pet rent” of $10 per cat. I agreed to all this, there being few alternatives. Based on my previous experience as a renter, I expected that most or all of my deposit would be refunded. The “animal addendum” I signed was a standard form from the Texas Apartment Association, but the language was severe to the point of intimidation. “We consider animals a serious responsibility and a risk to each resident in the dwelling,” it warned. Having notified me of my unlimited liability for any damages, injuries, or cleaning costs inflicted by my well-behaved indoor cats, the addendum informed me that I would be responsible for all de-fleaing, deodorizing, and shampooing charges. “We – not you – will arrange for these services,” it snapped. Duly noted. I wondered how pets could possibly be that much trouble for landlords. Cats might turn a portion of your sofa upholstery into ribbons, but rarely do they damage real estate. In all fairness, I did learn that some pets do a good deal of damage, especially in Southern apartments where beige wall-to-wall carpeting is ubiquitous (the wood floors of my native Northeast are less vulnerable). Too, some people are allergic to animals, hence the extra cleaning expenses. The charges still seemed exorbitant, and I consulted a landlord-tenant lawyer. He considered an initial charge reasonable since landlords can assume that pets will do some additional damage to an apartment, but he had seen the size of those deposits and fees more than double in recent years. The new practice of charging “pet rent” he interpreted as a pure money-maker for landlords. When I moved out of the complex five years of pet rent later, no “de-fleaing” was required. I was simply charged for the routine “full housekeeping” and carpet cleaning. I received a refund of approximately $300 (a simplification for the sake of blog brevity). The management acknowledged that my cats had done no damage. The various charges were justified on the grounds that they were standard and I had agreed to them. And so I blog my disagreement with what I have dubbed “the pet penalty.” The charges are excessive and the harshness toward pets and their owners is unwarranted. Landlords, take note. There are responsible pet owners who will be happy to rent from you if you are willing to buck the trend of making them pay through the nose. You will have little competition. And do make it easy on yourselves – instead of beige carpeting, go with a sensible wood laminate. And that is in God-blessed Texas. In and around DC, a non-miniature dog (anything over 25 lbs.) is a deal-breaker half of the time. When it is “okay,” it is by no means uncommon for the pet deposit to be $1000. I have tried to think about this charitably–“they are trying to pressure people to have kids instead of pets”–but my powers of self-delusion are not that impressive. Yes, and I came across an on-line complaint from a D.C. renter that her pet rent was $60. I think that The charges are excessive and the harshness toward pets and their owners is unwarranted. Thanks for sharing your info. I really appreciate your efforts and I am waiting foor your further post thank you once again. Thanks! Please visit the School of Humanities blog again. We post on a wide variety of topics. Yes! I know of the pet penalty very well. Having rented off and on for the last few years I always got a break though because I own my own carpet cleaning company. Granted my small dog makes a mess from time to time but he’s family and I’m not giving him up. Often people that rent will call me to come clean their carpet before they notify management that they’re on their way out. That way they don’t fail any inspections. And it’s not hard to get a carpet clean from a pet. Especially cats. And like you mentioned they almost never tear anything up beyond occasionally scratching on a sofa.